I have always have got a taste for the art world. But it was the trip to Paris, at 17, and in particular, a visit to Giverny that surfaced my passion for painting. Monet became the greatest influence in my life, and when I returned from France to Brazil, I began to take classes in painting, only watercolor. Unfortunately, despite the encouragement of my family to study various branches of art (music, dancing, and painting), all this should be just a hobby. For them, art should not involve a professional career. When I said that I wanted to study arts, they prohibited me. As I was very young at that time, I went to the area of ​​business. It had been a decade since I had gone to college, and I decided I had to go back to university to do what I liked. I started studying for the college entrance exam when I discovered that I was pregnant. So, I promised myself that during ten years I would dedicate myself to motherhood and leave my plans for later. When my son was nine years old, my husband realized how unfortunate I was with my financial career and he supported me very much to drop it, and he encouraged me to go back to painting. That was my trigger, my husband’s support. I went back to university to study literature at the age of 40 and I went back to painting. When I came back, so long after I had totally abandoned my brushes, there was one artist in particular who influenced me and motivated me: the Italian Agnes Cecile. I spent hours admiring each of her watercolors, the videos, looking at every detail as if looking at the reason for living. It was she, unknowingly, who helped me every day for my coming back because, at that time, I felt it was too late to come back. I started to post my watercolors on the Instagram and when I realized it, there were people that I did not even know me, sending me congrats and invitations for exhibitions, and commission. And this evolved until the various exhibitions, collective and solos in Brazil and abroad. I think it’s the challenge of proposing to go beyond the expected paths. It is not to accept “no”, not to conform to what the market expects and says to like, it is to say no to what has already been done and to seek a signature of its own, is not to settle with the doors that do not are open and look for someone who likes and accepts to take ones art to other spaces, is to appreciate the art of others and support peers, including consuming their art. What I do not like is the fact that many artists need to treat their production as crafts, selling their artwork at ridiculous prices to survive. While a few experts dictate the exorbitant price of some works. I see two scenarios. One in which Watercolor has been more and more prominent, but still considered an art secondary instead of oil. On the other hand, I see that the watercolor has all the versatility and flexibility possible. It is a contemporary but classic technique; clean, but that allows ink layers and toning; delicate, but intense; accurate, but translucent. Anyway, all the qualities that could exist to challenge an artist, exist in the watercolor. I honestly think that the world will still discover all the dimensions and possibilities of this technique. Art is the encounter, the dialogue, the crossing. Name artists you’d like to be compared to. My biggest admiration is for Agnes Cecile, whom I had the honor to meet last year and with whom I did a workshop. What strikes me most about her is the capacity for reinvention in portraiture, how her painting is transparent and smooth, and how it captures people’s eyes in a three-dimensional way. But I admit that my greatest inspiration is the Impressionists. Especially Monet and Van Gogh. I was very focused on the production of portraits and I was fascinated by the expression of the look, which I exercised exhaustively. But, I confess, I felt that I need a challenge, even if I did not realize it. On a family vacation to the southern Brazil in early 2018, I discovered, along the road, grasses like feathers in the wind. Fields and more fields on the fringe of the highway between São Paulo and Paraná. Thin stems and about 2m high, with what looked like to be a clear pink to a duster one at the end, dancing in the wind. We stopped the car because I needed to touch it, and to see with my hands, to find out if it smelled, to feel with my feelings and my looking. I went into the bush to reach the plant. Immense, beautiful, perfect. I wanted to stay there forever. I had no idea what that was. The most beautiful thing. It touched my deepest affections intensely and devastatingly. Soft touch, delicate stems filled with small seeds, thousands in each tuff, together forming pink spikelet that it went from clear pink to rosé, and which, in motion, seem to float. I took two flowers for me, they looked like a new form of dust-duster, a brutally aged rose at the base, and it gradually brightened at the tips. A friend told me the name of it: Cortaderia Selloana, better known as Pampas Grass. When I returned home, there was nothing that would make me go back to the portraits. I did a series of studies with the plant. I tried all the techniques I knew in watercolor to portray the grass more ethereally. Between studies, I created a first series of watercolors that were composed by landscapes with Pampas Grass. After it, I decided to go deeper into their painting, and I created a second series, which depicted in white background, the stems in prominence. Not satisfied, I started a third series, which I called Hairy Flower Spikelets. It is the stem of the Pampas Grass in extreme proximity, occupying all spaces of paper, with three levels of focal approximation. In about three months I produced about 100 watercolors. I was exclusively producing only landscapes. 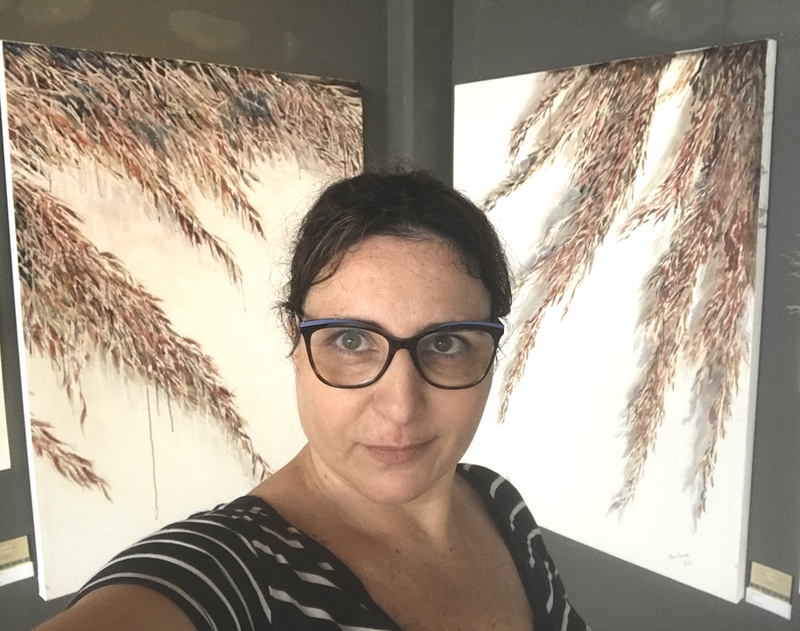 After painting Pampas Grass, I started to notice all grass types, how beautiful they are, how the wind movement makes the same landscape change, gain life, and it is even able to change the gradation of light and colors of the environment. So, I decided to portray several landscapes with varied grasses. Gradually my painting was gaining mountains, paths, colors, lights, and different aspects. When I realized, I had already changed my brushstrokes to try to keep up with the movement I wanted to register. This is how I began to create the landscapes of grass, and that is how I began to transpose these brushstrokes into the portraits. It is a moment of revelation for me. I see a lot of Impressionism in my current work, and I do not bother comparisons. On the contrary, I am proud. I wish I would be!